The hostel is situated within a villa made up of different houses, where there are many plants and trees. The atmosphere here is very calming ! When you exit the villa you meet with the local town life and atmosphere where there is everything conveniently located close by. A newly reformed house in the privileged location of Ipanema. 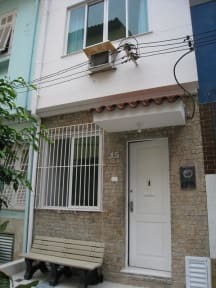 Near to international and national banks, juice bars, restaurants, bars, bus stops, the metro (General Osorio), supermarkets and the main high street. Ipanema is a safe and beautiful town. Voted one of the best locations in Rio. There are many juice bars and restaurants nearby, travel agents, money exchange, 3 supermarkets, 1 of which is 24 hours. There is also a 24 hour juice/bar on the corner of our street. The hostel has 2 private rooms that can fit up to 4 people if necessary (double bed and a bunk bed). 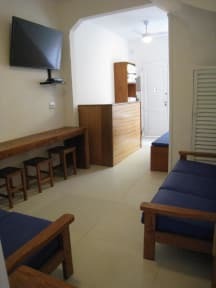 There is also 1 en-suite private room that can accomodate up to 6 people if needed. This rooms has 1 double bed in it and 2 bunk beds. There is air-con and decent fans in all the rooms. Good quality curtains. Hot water in all the bathrooms. Blankets as well if needed. Wi-Fi is free and works well in all the rooms. There is a one of charge of 5RS for bed sheets and a towel. There is a laundry service and a fully equipped kitchen with a water machine as well. We do not provide food here. There is a social room with a Smart internet t.v. with NETFLIX, a free guest computer and all the information you need at reception about tours, night life and general questions. All our mattresses and pillows have washable covers for good hygiene. We pay attention to keeping the hostel clean always. After 22hrs in the villa their is a quite time rule where guests from all the hostels in the villa (as there are a few hostels here) are not allowed to socialize outside. This is to respect the neighbours & people who are trying to sleep. But you can socialize outside the main gate or on the 24hr corner bar. Check out time is 12hrs (Lunch time). On the day you are checking out you just have to vacate your bed or room and leave your key at reception or with the cleaning lady. On the day you are checking out you can store you baggage at the hostel until 22 hours and use all the downstair facilities such as shower / internet / kitchen / t.v. / sofas etc. Guests can arrive at the hostel at any time. If you arrive early before your room or bed is vacant, you can leave your luggage stored and use the showers / internet / kitchen / t.v. / sofas etc, until your room or bed is ready.